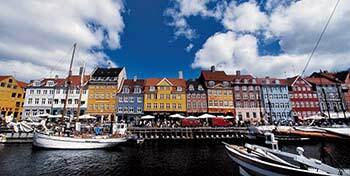 ABOVE: A panoramic view of Nyhavn, an old harbor district that now has many restaurants, caf�s, and bars. This English-language article is from Wikipedia. Read English-language news from Denmark. The Danish monarchy's Web site is in Danish and English. You can read about the royal family, its palaces, art collections, current activities, and more. Photo copyright © Morten Jerichau for Visit Copenhagen.